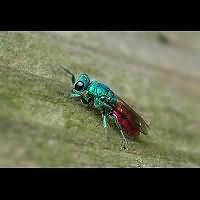 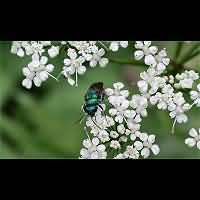 The insect below is a cuckoo wasp. 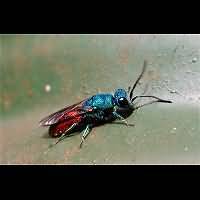 They are parasites just like the cuckoo bumble bees, only worse. 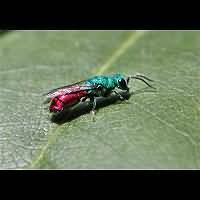 Instead of being fed by their host like the cuckoo bumble bees, they feed on the larvae of their host... 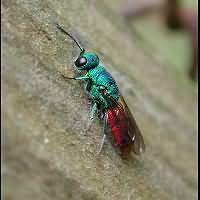 In the part of Europe we live there are over fourty species of cuckoo wasps and all have beautiful metallic colours. 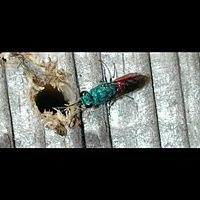 Most species specialize on a cerain host, but the Common Cuckoo Wasp (also known as the Rubytail) is not very specific: it uses all kinds of bees and wasps to let the larvae feed on. 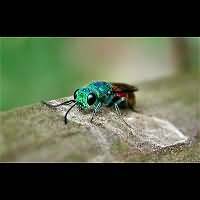 This page has last been modified on Saturday, November 24, 2018.